Frankie Bridge has finally revealed her wedding dress to the world – some three months after she tied the knot. The Saturdays star Instagrammed some black and white snaps from the magical day she tied the knot with Premiership footballer Wayne Bridge, on Tuesday. Frankie, 25, said ‘I do’ in a strapless white gown featuring layers of tulle on the skirt with a floral headdress attached to her veil. The bride’s bouquet was a small bundle of roses, and she accessorised with some sparkling drop earrings. The colour of the 34-year-old groom’s three-piece suit is hard to tell, but it’s clear they went for a light shade for the summery occasion. 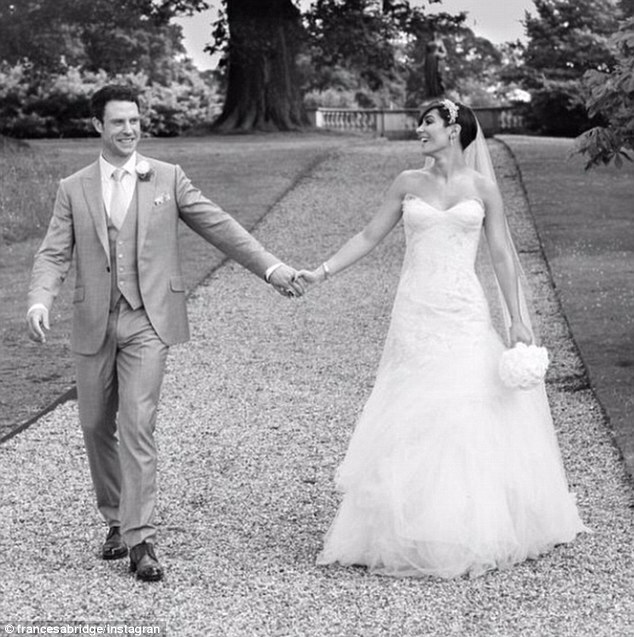 ‘What an amazing day,’ Frankie captioned the image of her and her husband walking hand-in-hand. In the second picture it showed the Bridge family including baby Parker, getting kisses from his parents. ‘Made even better by this little man,’ the singer wrote. The singer and footballer wed in July in Woburn Abbey in Bedfordshire after nearly four years of dating. Frankie is currently competing in Strictly Come Dancing and has so far has been praised by the judges.